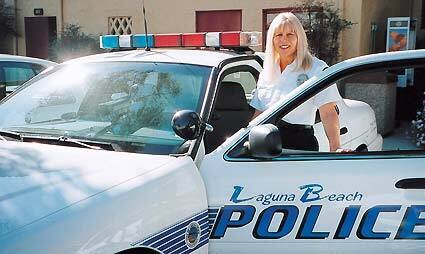 VOLUNTEER MINISTER GAYLE THORSEN: wife, mother and Laguna Beach, California, police chaplain. A trained Volunteer Minister, Thorsen provides counseling to people she meets as police chaplain to assist them in overcoming difficulties they may be having in life. 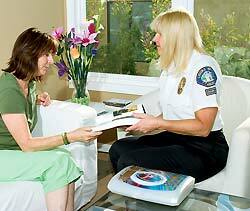 She is equipped with tools and methods to help a person resolve problems, large or small. Gayle Thorsen remembers vividly that terrifying New Year's Eve more than a dozen years ago. Just as midnight struck, a stray celebratory bullet felled Thorsen, landing her in the hospital, the slug still lodged in her abdomen, near the spine. Initially, her hopes rode on the prospect of surgery to remove the bullet and end the pain. Instead, she was told it was less damaging to leave the bullet where it was, rather than attempt to surgically remove it. The physical agony that went on for months finally abated, but the emotional anguish did not. Thorsen found herself almost paralyzed by a fear of what catastrophe might befall her next, compounded by a terror of guns and bullets. The compulsion to avoid potentially dangerous situations became obsessive, she recalled. "I Had to Answer that Call"
But all that has changed. Thorsen, the mother of two teenage daughters and the wife of a successful marketing executive, leaves the house each day to do her part to "protect and serve" her community — as a volunteer police chaplain in Tustin, California. One of hundreds of volunteer police chaplains across the nation, Thorsen helps law enforcement personnel deal with the spiritual and emotional upheaval that is part of the police beat. She feels she brings valuable skills to the job, thanks to her training as a Volunteer Minister of the Church of Scientology. "There is much more that we can do than wait helplessly for bullets to fly and bombs to drop." It is a humanitarian calling that has more than its share of dangers. Thorsen was warned by instructors early in her training that a chaplain can be at risk. Some, they said, had been shot in the line of duty. But by now, she had risen above those fearful years, and she accepted the danger as part of what she felt motivated to do — to help. September 11 defined the no-turning-back moment, said Thorsen. On that day, the leader of her church issued a "wake-up call" to all Scientologists to do more to help others and to participate in creating a better world. "I knew I had to answer that call for myself and my children — and for our police force. They do so much to keep us safe that most people never hear about," she said. Her police chaplain career began in September 2002, a short while after completing her Volunteer Minister training program at the Church of Scientology of Orange County, where she and her family are active members. She was called to help at the local police station when a young officer was shot during an attempted robbery. Thorsen went directly to the police station and found the wounded man's fellow officers upset and distraught. For they were suffering from a different sort of trauma; as the backup officers at the scene of the shooting, they had been forced to shoot the suspect in self-defense. He had died of his wounds. "These things happen all the time on TV shows and in the movies," Thorsen said, "but in real life the killing of another human being can cause very severe emotional distress. The police officers felt it deeply." Thorsen knew what to do, and for her part, she found she left behind forever her own personal demons that night. "I had no time to indulge my own fears. There were too many other people to help," she said. "I administered assists throughout the evening, procedures that encourage a person to unburden himself — and recount a traumatic incident as many times as needed, until he experiences relief." She then went to the hospital intensive care unit to minister to the 24-year-old wounded policeman and his family. Impressed by results of Thorsen's help in the emergency, the police gladly accepted her application for the Laguna Beach Police Department's chaplain training program. Soon she was in training with 19 other civilians in "Citizens' Academy, Class #7," of which she was elected president. She was sworn in as a volunteer chaplain on January 6, 2003. In addition to caring for her family, coaching a girls' soccer team, volunteering at her daughters' schools, carrying out business projects and continuing her volunteer chaplaincy, Chaplain Thorsen has taken on an ambassadorial role for the Laguna Beach Police Department. On any given week, her calendar includes community and police-related speaking engagements, attendance at community and police functions, and activities with other police organizations and chaplain units. At the request of the Southern California Chaplains Association's president, Warren Johnson, she also now conducts disaster response workshops for police chaplains. Thorsen's leadership at the Laguna Beach landslides drew attention in police and rescue circles throughout Southern California on June 1, 2005, providing a working model for chaplain units to utilize in disaster response. According to Johnson, the chaplains association now looks to Laguna Beach's chaplain team to lead the way for effective chaplaincy work throughout the region. Also of great benefit to the police and vital for the community is Thorsen's crusade to people across the nation to lend their support to law enforcement. She has introduced the Volunteer Minister program to other police departments, and encourages people of all faiths to actively contribute as chaplains. "There is much more that we can do than wait helplessly for bullets to fly and bombs to drop. It starts with every one of us setting aside our own fears and concerns and doing something for others," she said. "When I hear someone talk about crime, violence, drugs, illiteracy and moral decay sucking life out of our cities, I strongly recommend volunteer work with local police organizations as an answer to giving back to the community," said Thorsen. "That's really what my work — and the Volunteer Minister program — is all about." 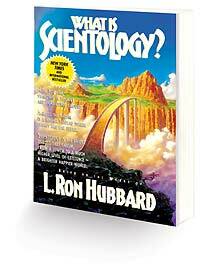 Scientologists are people who knew life could be better. They are also people who are able to think for themselves. When they found out that Scientology recognized you are a spiritual being, that it enabled you to truly know what and who you are, they decided to examine it further. And that's why so many millions of people from all walks of life in more than 159 countries are Scientologists today. Now armed with practical answers to the mysteries of life, they have real solutions. Workable methods to make life better. Just like they always knew could be. But don't take someone else's word for it.